The Phillies' pitching coach has been one of the team's biggest sources of success. As they were filing their way down the dugout on Tuesday afternoon, his guys were giving him some playful grief again—“Uh oh, another interview for ‘Kranny,’” one quipped. Phils’ starting pitcher Nick Pivetta just shook his head as he walked by the dugout railing at Citizens Bank Park, wearing a grin that spanned from right to left field, as he stepped down into the tunnel towards the Phillies’ clubhouse. The Phillies are one of the surprise teams in baseball two months into the season—and a big reason has been their pitching, especially their starting pitching. A big reason for that, according to Phillies’ manager Gabe Kapler and Phillies’ pitchers, is pitching coach Rick “Kranny” Kranitz. The Phils are sixth overall in pitching in Major League Baseball with a collective 3.43 ERA, are tied with three other teams for third with 5 shutouts and tied for sixth with the Los Angeles Dodgers in opponent’s batting average, with teams hitting a paltry .238 against Phillies’ pitching. In May, Phillies starting pitching is producing a 2.13 ERA (24 ER over 101.2 IP) and has 110 strikeouts. Last year, Phillies pitching ranked 18th in MLB, with a 4.55 ERA, more than a run a game over this season, with a total of 7 shutouts and opposing teams hitting Phils’ pitching at a .265 clip. That's quite the turnaround. Kapler also stressed how important it was for Kranitz to be a holdover from Pete Mackanin’s staff, when Kranitz was the assistant pitching coach under Bob McClure. Kranitz was able to supply Kapler with the backstory of Phillies’ pitchers. It’s Kranitz who has a history with Hector Neris, with Luis Garcia, with Aaron Nola and Pivetta, who was 2-4 with a 4.85 ERA after his first 10 starts last season—and 4-2 with a 3.23 ERA after 10 starts this year. “It’s really nice to have [Kranitz] to lean on,” Kapler said. 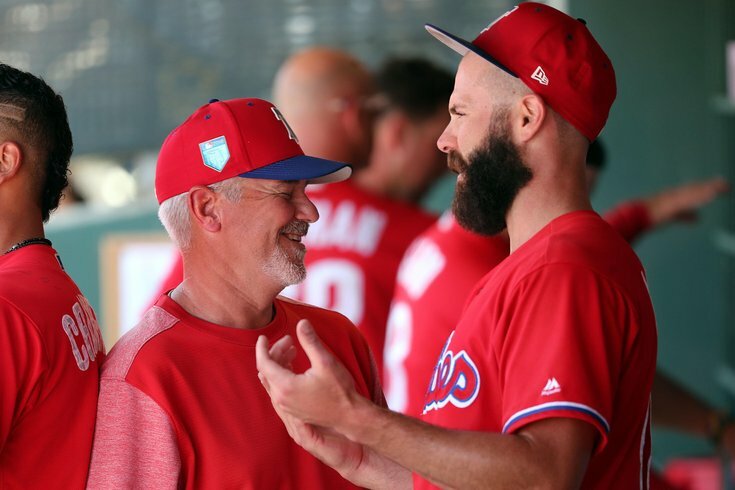 “This is a very talented group, whose stuff is undeniable, and right now, it’s all about being consistent,” stressed Kranitz, who came to the Phillies in October 2015 and was the bullpen coach in 2016 and assistant pitching coach under McClure last season. “Consistency in this league relates to success, especially if you have good stuff. We concentrated on their strengths, building on that and getting them to believe in themselves. “I think last year was a good time for me to step back, because I had coached for 10 years. Bob in his own right is a very good pitching coach, and I really enjoyed my time with him, and saw guys grow with him, even though some of the numbers didn’t say it. Then, all of a sudden, you’re in a position to go and I saw some things I felt would work. It’s not like I changed a lot as a pitching coach. Kranitz’s strength is his ability to look at each pitcher individually and not group them. He has a simplistic approach—and an aggressive approach, which Phillies’ pitchers have taken to. “Once I see their pitches, we’ll build a game plan with that in mind,” Kranitz said. “What they can do, where they can throw them, what they can do in each count, and build a plan accordingly. For instance, if you have a four-pitch starter like Nick or Vinny [Velasquez], you work real hard on what hitters can handle sliders, and who can handle breaking balls. It’s so important how our right handers handle left-handed hitters. Nola says Kranitz has been a huge help to him over the last few seasons. Nola has emerged as a real Cy Young contender in the National League, and at 6-2, with a 2.37 ERA, he’s among the top 10 pitchers in baseball. “He helps me keep things simple out on the field, in the bullpen sessions, and stresses not to do too much,” Nola said about Kranitz. “Kranny likes to focus on my delivery. Last year, I got hurt, and this year, I’ve learned more about myself and my body, the more I understand my mechanics and my delivery. It’s not coming not just in games, but in our bullpen sessions. “I think my command comes from my delivery. You hear a lot of people say ‘Repeat your delivery, repeat your delivery,’ but I think for me, it’s body movements and knowing where the ball can go when my body is off a little bit. I think it’s a big transition from last year. I worry more about what I’m doing and pitching to my strengths. When you try to pitch to a hitter’s weakness, that’s not our strength. The Phillies didn’t win their 27th game in 2017 until July 2—when they were 27-53. They’re 27-19—on May 23 this year, 1.5 games out of first in the National League East. A reason why is Rick Kranitz.